Mining News - What is the Likely Impact of Currency Depreciation on Indian Steel Sector? What is the Likely Impact of Currency Depreciation on Indian Steel Sector? Mining News Pro - The U.S. government announcement of steep tariffs on steel and aluminium imports in the month of March 2018 has irked a trade war like situation between U.S. and other economies including China, India, Canada, EU (European Union) to name a few. According to Mining News Pro -The U.S. government announcement of steep tariffs on steel and aluminium imports in the month of March 2018 has irked a trade war like situation between U.S. and other economies including China, India, Canada, EU (European Union) to name a few. Amid this situation, the U.S. dollar (USD) strengthened against currencies of various other countries. The situation was further aggravated from July when global oil prices started climbing after U.S. asked its allies to end all imports of Iranian oil by November. Concerns over supply disruptions in Libya and Canada also pushed prices higher. Why is Indian Rupee depreciating? Given that India is the world`s third largest oil importer, any hike in global oil prices inflates the import bill and disrupt the fiscal position in the form of an increase in its current deficit (imports exceeding exports). The Indian rupee has been one of the worst performing major emerging market (EM) currencies in 2018, and the worst in Asia-Pacific. India`s current account deficit (CAD) has already widened 42% year-on-year to USD 160 billion in FY18, and a high deficit means the country has to sell rupees and buy dollars to pay its bills which further reduces the value of the rupee. Now, given that the current account deficit is likely to remain under pressure, the rupee is likely to remain weak for some time, raising external funding costs for Indian firms even as it feeds into domestic inflation. This trouble of a depreciating rupee is spreading and now the fall in the Indian Rupee is set to affect the domestic steel manufacturing industry. As per the market reports, Indian steel industry is gearing up to hike steel prices from the month of September to counterbalance the fall in the rupee and the rise in the cost of raw materials. 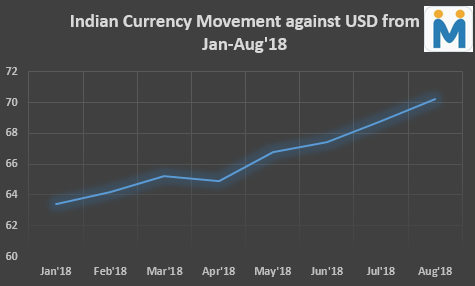 During Jan-Aug`18, the Indian rupee has depreciated by 11% whereas in case of raw materials, the price of imported coking coal, a key raw material in steelmaking, has increased 14% since June (on a y-o-y basis). Prices of graphite electrodes including those that are imported have increased 16%. And prices of iron ore, largely produced domestically, have gone up 11% and iron ore fines prices by merchant miners in Odisha rose by INR 900 per tonne. For steelmakers, logistics cost have also inflated due to the higher cost involved in importing these raw materials like coking coal and other fuels. The industry expects a price rise of INR 1,500 per tonne for both hot rolled coils in flat products as well as downstream products. For long products, the increase may be more. However, the increase in steel price is likely to close the gap between the price of steel in the domestic and the international markets. At present Indian steel is 5-8% cheaper than its prices abroad. This will obviously add to the Indian manufacturers` pricing advantage while exporting. This price rise will be reflected in the long-term and quarterly contracts that these companies will draw for the automobile sector effective from October. The price increase due to cost-push inflation will inevitably affect the earnings of steel companies during the second quarter and adding to this, due to monsoons construction and infrastructure sectors are witnessing a lull, leading to restrained demand.